We are offering Pig Repellent to our clients. Repeller is a natural, herbal, insecticide and fly repellent which does not harm the skin of animals. - Acts as a mild insecticidal. Cippy Bio International have innovated a novel organic fertilizer X-Guard as a feral pig repellant having …multiple effects. (2) Promoting growth of the plants …..
Organic product made from vegetable and herbal extracts, branded as Subhoomi Repellent - Pig is to control the problem of Pigs / Wild Boars in a non-violent way. Its smell keeps the animals away. Highly reactive Dog Repellent Chemicals is offer to customer. These Dog Repellent Chemicals are manufactured using quality chemicals that we sourced from vendors of the market. The Dog Repellent Chemicals are for the process is ferric hexacyanoferrate and in wildlife damage management. Function : It act as a best animal repellent. It is best for repel wild Pig which damage field crops. 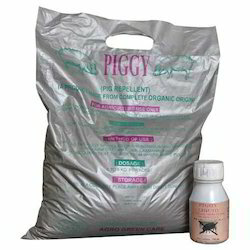 We offer Pig & Nilgai Repellent which is used as liquid in 75-100 ml in knapsack sprayer and spray surrounding farm repeated after 4-5 days, use granules in 5 kg /acre. 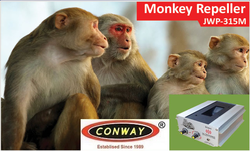 Unit Dimensions : 5-1/2" W x 3-1/2" D x 14- 1/3" H.
Animal Breed: Monkeys, Bear, Rackons, Pigs, Vultures.